Go Shoe Shopping Like a Pro! Today's post is by Cathie Maud: she's a Vancouver-based lifestyle, travel, and fashion blogger who channels Audrey Hepburn-elegance. Be sure to check out her blog, Miss Cathie! We all know that “you get what you pay for”. . .
It’s important to have quality shoes – after all, if you aren’t in bed, you’re in them! But besides the price/brand, what else is important in a shoe? Well, you knew comfort was coming. Cheaply made shoes just aren’t your feet’s best friend, and simply putting both shoes on and walking around for a bit is not enough to tell whether a shoe is the perfect fit or not. It’s important to think of factors like breathability and the materials used as well. 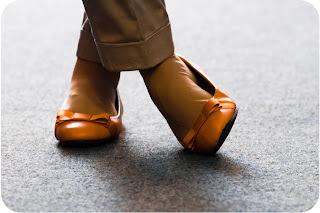 For example, ‘leather-like shoes’ most often mean polyurethane materials (think plastic and vinyl) and while they are on the whole more inexpensive, they do not have the breathability that leather provides. Sweat abounds, and should you happen to be in heels, you may find yourself slipping towards the toe box and scrunching your toes. In addition to risking your comfort, varying weather conditions may also cause faux-leather shoes to crack, and really… you might as well have spent your hard-earned pennies on something that will last you a great deal longer. This leads us to our next requirement. . . When you intend to spend more than $30.00 on a pair of shoes, of course you want to make sure that it is worth the cost and will last longer. So take the time to sit down and inspect the shoe –this is what your money will be purchasing, it’s worth familiarizing yourself with the details! Check to see that the glue that holds the sole to the shoe is not messily applied (a sign of poor craftsmanship) and oozing out of the sides. If it looks clean, don’t be afraid to tug at the sole a little to test if it will come apart. Check the inner body of the shoe for fraying or loose seams. If you’re inspecting a pair of heels, be sure to see that the heel is firmly attached to the seat (the back of the shoe where your heel is). If there are embellishments on the shoe, make sure they are firmly attached. A well-crafted shoe lasts for years, and it may be a good idea to purchase something in a more classic style, perhaps with a little detail to let your personality shine through. That way, it will last long not only in the measurement of years, but of style. Remember, your shoes are the only thing that separates your feet from the cold, hard pavement –it’s well worth taking the effort to find a pair that wouldn't make you rather you were barefoot! I tell you! I wish IPads were a little more blogger friendly. It keeps on freezing the keyboard. Anyways... Hehe. I love leather shoes, moccasins, penny loafers and oxfords. I've been hoping to get a pair of boots for 1840s/Civil War reenacting, but they are a little expensive for only wearing a coupe times a year. At least my feet aren't growing! Hehe. I think one of the shoes are neat enough to wear everyday. The brand I'm aware of are "Robert Lands" (from Canada) and Fugawee. I love the shoes from "Robert Lands" they are so cool. It's amazing the difference a well fitting pair of shoes make. I bought a pair of Nikes (at a thrift store!) last year and they are so much more comfortable than any shoes I'd been wearing for years. My sister tells me buying second shoes are bad, but these were practically new, so I suppose there are exceptions to every rule. Living Modestly: This world is not our home. Barkeeper's Friend: Is it Safe?